Difference between revisions of "Horch, Esther Hiebert (1909-1994)"
Esther Hiebert Horch: musician and teacher; born 30 July 1909 in Mountain Lake, Minnesota, USA, to Cornelius N. Hiebert and Tina (Harms) Hiebert. She was the eldest of ten children, four of whom died in childhood. On 29 June 1932, Esther married Benjamin Horch at the North End Mennonite Brethren Church in Winnipeg, Manitoba, Canada. The couple had one daughter, Viola. Esther worked as a teacher, radio speaker, and social worker in Winnipeg and elsewhere, also working with immigrants from Russia and serving as a deacon in her church. 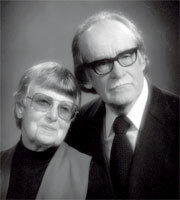 Her husband died in 1992, and Esther died on 29 January 1994 in Winnipeg. In her early years, Esther and her family moved frequently, following C. N. Hiebert’s calls to ministry and study in Minnesota and Oklahoma, USA, as well as Saskatchewan and Manitoba, Canada. Esther began her education in Fairview, Oklahoma, but by the age of 16, she had attended schools in several different towns and cities. She became involved in evangelism and Bible distribution together with her father, as well as with helping refugees from Eastern Europe after the Russian Revolution. When she finished high school, she decided to train to become a teacher, becoming one of the first women to teach in Manitoba’s public schools. Esther became a member at the North End Mennonite Brethren (MB) Church in Winnipeg, where she met her future husband, and the two were married at the church on 29 June 1932. They had one child, a daughter named Viola, who died in an accident on 26 April 1968. After her marriage, Esther began a kindergarten at the church to earn some money. In 1939, the couple decided to move to California, USA, for Ben to continue his church music studies at the Bible Institute of Los Angeles. During this time, Esther lost her left arm as the result of a car accident. In 1944, Ben and Esther moved to Manitoba, where Ben taught at the Winkler Bible Institute before moving to Winnipeg to teach at the Mennonite Brethren Bible College. Esther also worked at the college as the Dean of Women, as well as teaching English there and hymnology at both Mennonite colleges in Winnipeg, and also singing in the choir. In the 1950s, she also worked as a storyteller for CFAM radio in southern Manitoba, becoming known as “Tante Esther” and telling the history of common hymns. During this time, she and her husband also participated in producing the Gesangbuch der Mennoniten Brüdergemeinde, a German hymnal for the Canadian MB Conference, in 1952, followed by the English translation, The Hymn Book, in 1960. Later in her career, Esther switched from teaching to social work, serving at Logan Neighbourhood House and Marymound in Winnipeg while she took courses at the University of Manitoba. She also wrote articles on hymnody for various Mennonite publications, as well as many letters to family and friends. In 1979, she published a story of her father’s life and ministry, also telling many stories about the rest of the family. Even after her husband’s retirement in 1973, Esther continued to stay active, serving as a deacon in the church. Ben died in 1992, and Esther died on 29 January 1994 in Winnipeg. The funeral was held at the First Mennonite Church in Winnipeg. Esther Horch was a dedicated musician, teacher, and social worker who used her many skills to benefit the people around her. Despite the tragedies in her life, she always managed to find ways to serve others, becoming an example for her family and the community around her. Canadian Conference of Mennonite Brethren Churches. “Benjamin Horch (1907-1992) and Esther Hiebert Horch (1909-1994).” Web. 31 March 2010. http://www.mbconf.ca/home/products_and_services/resources/published_genealogies/personal_papers/horch_benjamin_and_esther_hiebert_horch/ from The Ben Horch Story by Peter Letkemann. Dueck, Abe. “Esther (Hiebert) Horch: A Gifted and Generous Woman.” 10 May 2006. Web. 31 March 2010. http://www.mbhistory.org/profiles/horch.en.html. Horch, Esther. C.N. Hiebert Was My Father. Winnipeg, Man. : Board of Publications, Canadian Conference of Mennonite Brethren Churches, 1979. Mennonite Brethren Herald 33(18 March 1994): 29. Die Mennonitische Rundschau (5 March 1975): 1; (April 1994): 29. Huebert, Susan. "Horch, Esther Hiebert (1909-1994)." Global Anabaptist Mennonite Encyclopedia Online. March 2010. Web. 26 Apr 2019. http://gameo.org/index.php?title=Horch,_Esther_Hiebert_(1909-1994)&oldid=65428. Huebert, Susan. (March 2010). Horch, Esther Hiebert (1909-1994). Global Anabaptist Mennonite Encyclopedia Online. Retrieved 26 April 2019, from http://gameo.org/index.php?title=Horch,_Esther_Hiebert_(1909-1994)&oldid=65428.